With competition to get into Oxbridge now so fierce, this book goes beyond standard application technique to focus on long-term development of intellectual potential including insight into the power of positive decision-making; how to practise independent and critical thinking skills; and how you can develop extra-curricular knowledge in genuine and impressive ways to stand out from the crowd. 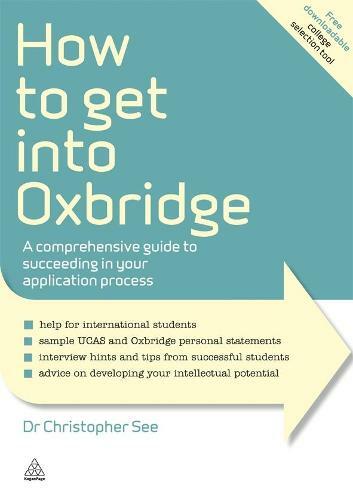 The book includes practical and insider knowledge that can't be found elsewhere - like how to strategically choose your college to boost your chances of admission, and how to interpret and respond to interview questions in a way that demonstrates your intellectual curiosity and academic potential. You'll find sample personal statements; examples of interview questions for all subjects; practical advice on fees and funding; and how to manage parents and peers. There is also a chapter dedicated to International Students. Online supporting resources for this book include a table including collect selectors for Oxford and Cambridge.